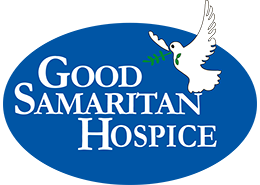 Good Samaritan Hospice director Jim Pride, a former business owner and realtor, was asked by Janet Melton to come to work at her new company in 2009. And he did. “While I enjoyed the work, it wasn’t something I was passionate about,” Pride admitted. But then, something amazing happened. He had been working there for a few months when he received a phone call one Friday at 4 p.m. One of his patient’s wives was asking for some help. Her husband was under hospice care and he needed some supplies for the weekend ahead. Pride volunteered to drop off the items Good Samaritan Hospice provides to their patients. He arrived at the South Huntsville residence and knocked on the door. The wife asked him to bring the items into her husband’s bedroom. “There was a frail older gentleman suffering with COPD,” Pride recalled. “His head perked up and he asked ‘Who are you?’ As I was telling him who I was, I ended up sitting down and chatting with this elderly couple for quite a while. When I left, all I could think about all of the way home was that I actually made a real difference in their lives that day. “The next morning, my wife and I were drinking coffee and I told her then, ‘I really believe I’m going to work on Monday morning with a different outlook. I can see now that I can make a difference, and I can help people. That was my moment of clarity.” Pride has been there ever since. Pride spends many of his days presenting to local groups, educating them on the role hospice plays during end of life care. 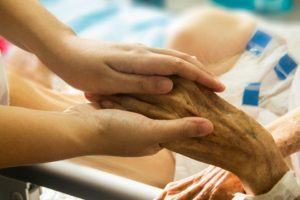 For example, Pride discovered that the general public often doesn’t realize that hospice is a benefit, usually covered by either Medicare, Medicaid or private insurance. “The inability to pay should never disqualify any individual from receiving quality end-of-life care,” Pride reassured. Another misconception is that people associate hospice with the last few weeks or days of someone’s life. Contrarily, people can have hospice for as long as they continue to meet criteria. Pride explained, “In the most basic sense, if the patient is still declining, you have an unlimited number of certification periods for hospice to serve you, as long as you meet criteria. The criteria vary for different diseases.” Pride went on to explain that there are two consecutive 90-day certification periods at first, and if the patient continues declining after that six months, their team can re-certify them after that for an unlimited number of 60-day periods as long as needed. 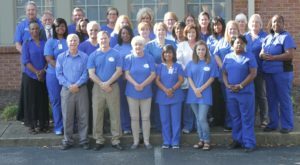 Best in Business Award recipient Good Samaritan Hospice serves all of Northern Alabama. For more information, please visit gshospice.com or call (256) 772-8108. Consultations are always complimentary.